Pine Meadows is located on the north side of scenic Belwood Lake on a 65 acre development, which is ideally situated in the peace and quiet of the countryside. Our community offers an abundance of walking trails that connect to other external trails, which will keep you active and healthy. Not more than a few minutes away lies the quaint village of Belwood, home to a traditional General Store, bakery, delicatessen and some of the best butter tarts around. In a park-like setting across the street is the popular Super Snax restaurant, whose home-cooked meals enjoy quite a following. Our community is also on the outskirts of Fergus and Elora where grocery stores, entertainment, churches, doctors and hospitals are less than 15 minutes away. Elora is perhaps most famous for the scenic Elora Gorge—a wonderful nature retreat of river, forest and limestone. The famous Fergus Scottish Festival and Highland Games are held in Fergus every year. For theatre buffs, the Fergus Grand Theatre and Elora Festival offers numerous events including community theatre and world-class musical performances. Outstanding dining establishments can be found in both Fergus and Elora. .A mere 30 minutes away you’ll arrive at historic St. Jacobs in the heart of Mennonite country, a stone’s throw from Waterloo and Kitchener. Drayton Entertainment mounts first-class theatre at several locations, and Guelph, with its renowned university, is only 20 minutes away. Orangeville can be reached in 20 minutes and Toronto in less than an hour and a half. When it comes time to get involved, there are many activities and events here to tempt you. All you need to do is take the time to experience it all. 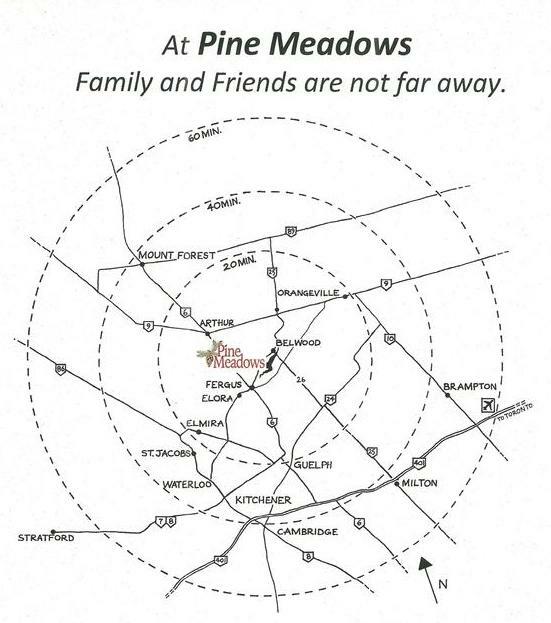 Pine Meadows: it’s your place to be you.